Why not gift yourself with a personal “in-home” spa retreat? 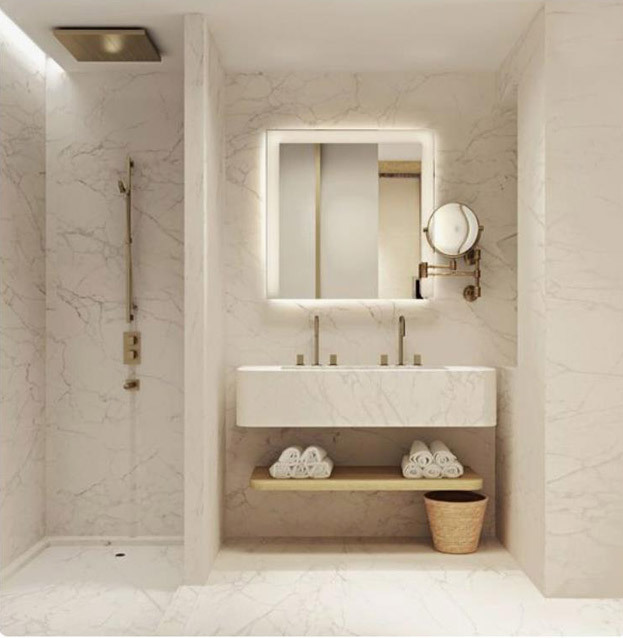 On a budget or not, a glamorous, simple and inviting bathroom space is a perfect place to retreat to for some peace and relaxation no matter what type of bathroom you have… something we all need to do for ourselves. Whether it’s a powder room, guest or master bath, Jack and Jill bathroom, a Hollywood bath (a shower/bath, toilet and vanity/sink in one room and a separate vanity/sink and mirror in adjacent area) or ‘ensuite’ bathroom (accessed from the bedroom – private), maybe it’s time to consider enhancing the rooms with special details or upgrades. 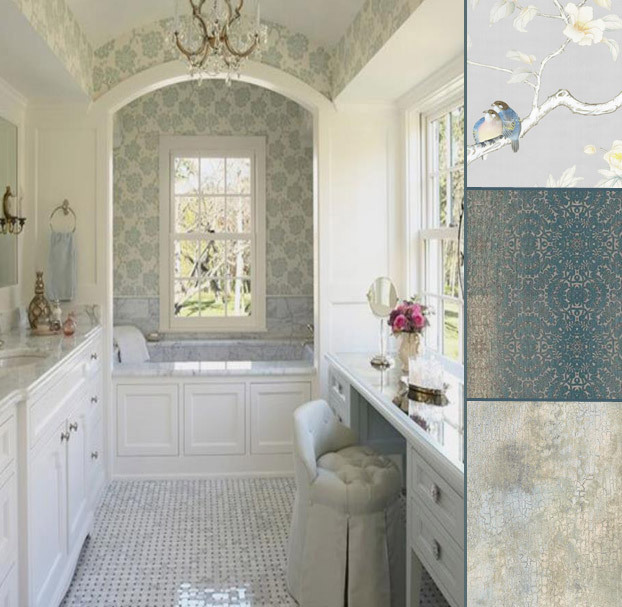 Let’s start with a unique wallpaper…… a mood changer – put it on the ceiling too, creating a cocoon atmosphere. 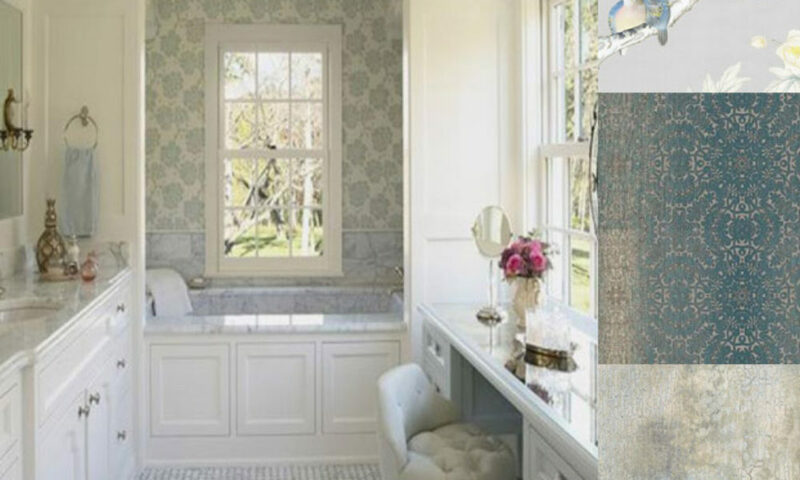 A window or vanity can be the perfect place for a blooming orchid or tailored roman shade for view and privacy. 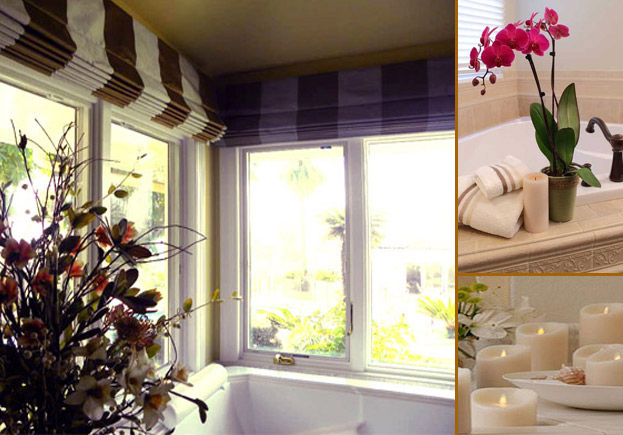 Surround the room or tub area with flameless ‘remote’ candles when soaking in the tub and soothing surround sound music. Don’t forget updating with decorative mirrors, mood lighting, vanity table for makeup area and possibly mounting shelving for towels or adding a tower cabinet for additional storage. 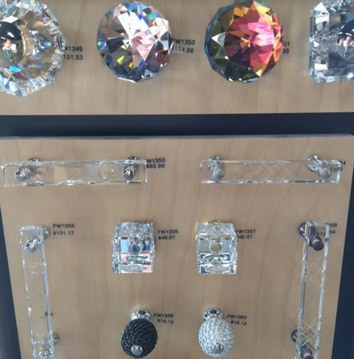 Glass or textured cabinet pulls is the accessory to any cabinet or drawer…..a must! Let your imagination run, express yourself and always remember “anything goes” as long as you tie the design elements together. Make time to treat yourself to a ‘retreat’ in your own home. If you have any design questions, I am here to help! Christina Higuchi is Interior Designer/Owner at Dezine Refined – Interior Design For Good Living in beautiful La Quinta, California. “Dezine Bytes” and “Interior Design For Good Living” are Trademarks of Christina Higuchi, Dezine Refined ©2018 Christina Higuchi, Dezine Refined. All Rights Reserved.